PLAYA DEL CARMEN, Mexico -- Johnson Wagner won the Mayakoba Golf Classic on Sunday for his second PGA TOUR title, beating Spencer Levin with a par on the first hole of a playoff. 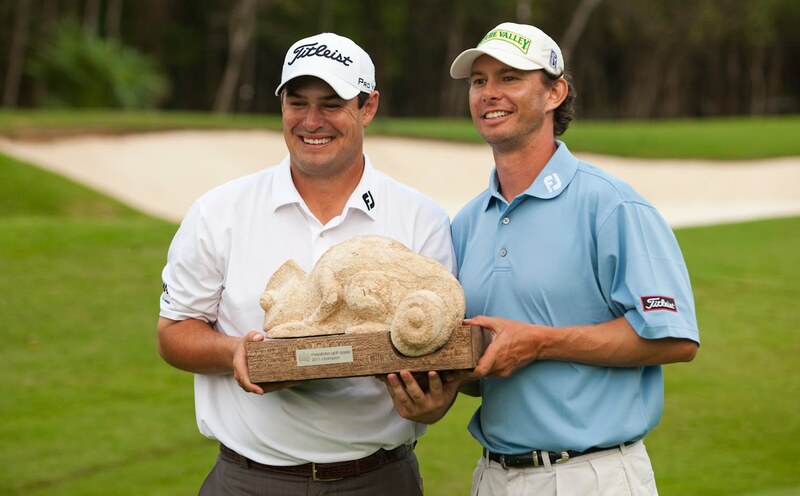 Wagner, also the 2008 Shell Houston Open winner, closed with a 4-under 67 to match Levin at 17-under 267 on the Greg Norman-designed El Camaleón course. Levin shot a 65. "I haven't really had time to think about it, but I'm just beside myself excited," Wagner said. "I've been working really hard, and it's just nice to see stuff pay off when you work hard. It makes you want to work even harder." "Obviously, right this second I'm not very happy, but yeah, overall it was a good week," Levin said. "I'm happy about it." Wagner: "I'm just beside myself excited. I've been working really hard, and it's just nice to see it pay off. "Wagner had four birdies -- on Nos. 7, 8, 11 and 13 -- in a bogey-free round. He earned $666,000 in the event played opposite the World Golf Championships-Accenture Match Play Championship in Arizona. "Unfortunately, it's opposite the World Match Play, so the only way I would not be here is if I was in the top 64 in the world," Wagner said about defending his title next year. "But if I'm 65th, you can dang sure bet I'm going to be here. I've loved it here, and it would actually be sad if I did get to 64 in the world and didn't get to come back and defend. I've loved every minute I've been here." A former Virginia Tech player who grew up just north of New York City in Westchester, Wagner opened with rounds of 69, 66 and 65 to take a one-stroke lead over Stroud into the final round. "You have to drive the ball very straight," Wagner said about the course. "You have to hit quality iron shots into the greens. Fortunately, I was in command of my game a little bit this week and got away with some bad shots. But beautiful conditioned golf course, one of the best we'll play all year. The fairways are perfect." Levin, winless on the PGA TOUR, birdied five of the first eight holes. He dropped a stroke on No. 12, then rebounded with birdies and Nos. 13 and 17. "Spence and I have played a couple rounds together competitively, a few practice rounds," Wagner said. "Spencer is one of my favorite guys out here. He's played great this year. He's just a real emotional guy, real great player, gets a lot out of his game. Spence is one of the best guys out here, always wanting to chat and always seems to be in a pretty good mood. He's a good man." Levin struggled in the playoff on the par-4 18th. "I hit a bad drive. That's pretty much it," Levin said. "It's tough when you go in the trap. I hit a bad drive and a bad third shot." The 53-year-old Cook had his best PGA TOUR finish since tying for third in the 2006 St. Jude Classic. He won the Champions Tour opener in Hawaii in January. "I just feel comfortable," Cook said. "I had nothing to lose this week. I enjoyed seeing everybody. I've seen guys I haven't seen in four or five years and it was fun to come back and compete again for one last time." Johnson Wagner, ganador Absoluto del Mayakoba Golf Classic 2011 de la PGA Tour.